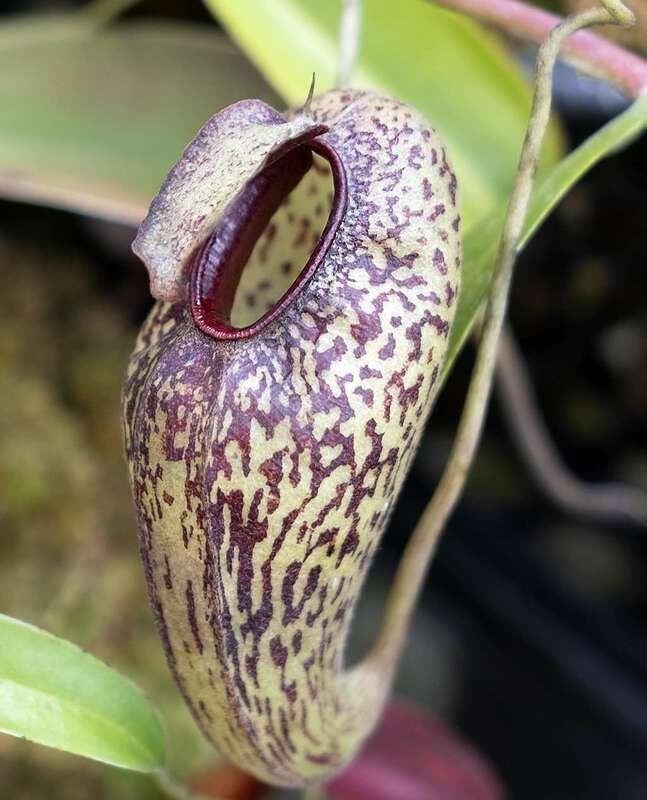 This new species is easily distinguishable from all others by the peculiar pitchers without peristome and with very narrow lid. 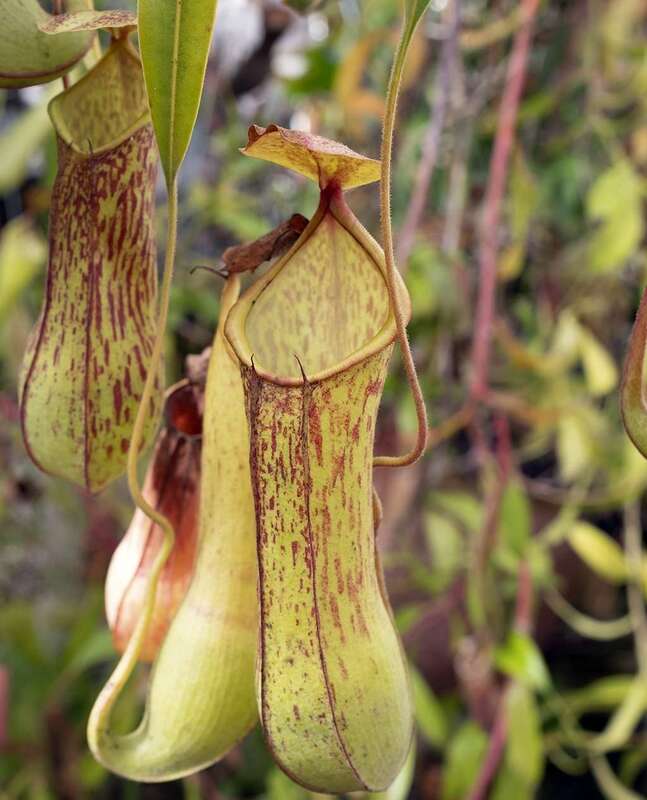 Probably it is most nearly related to N. Bongso. 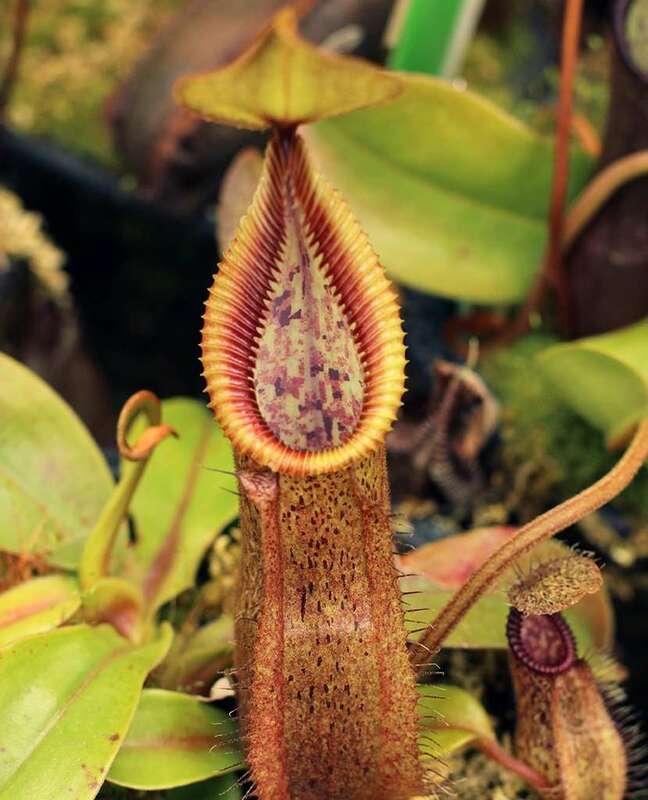 The written words “Galoe-galoe antoe” and “kandjong baroek” were found on a few of the original Bünnemeijer specimens. 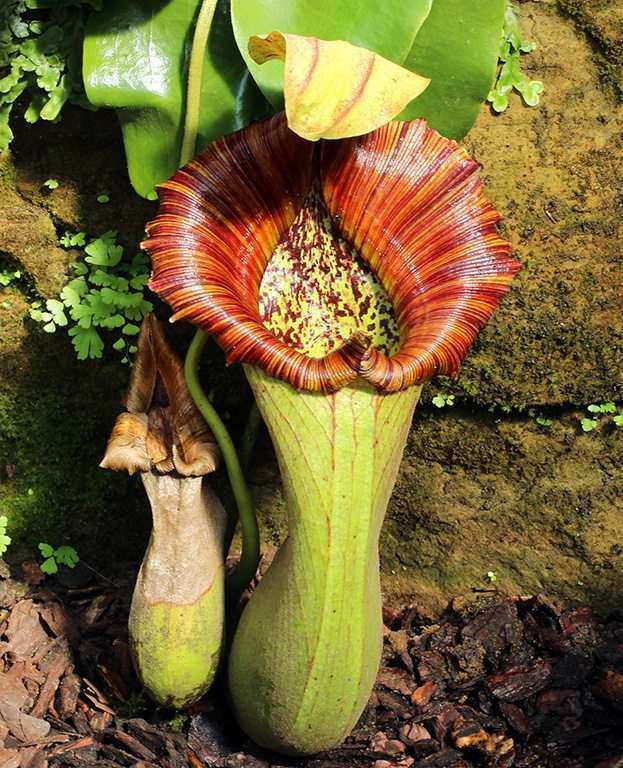 This was the name of the plant in the local Minangkabau language. 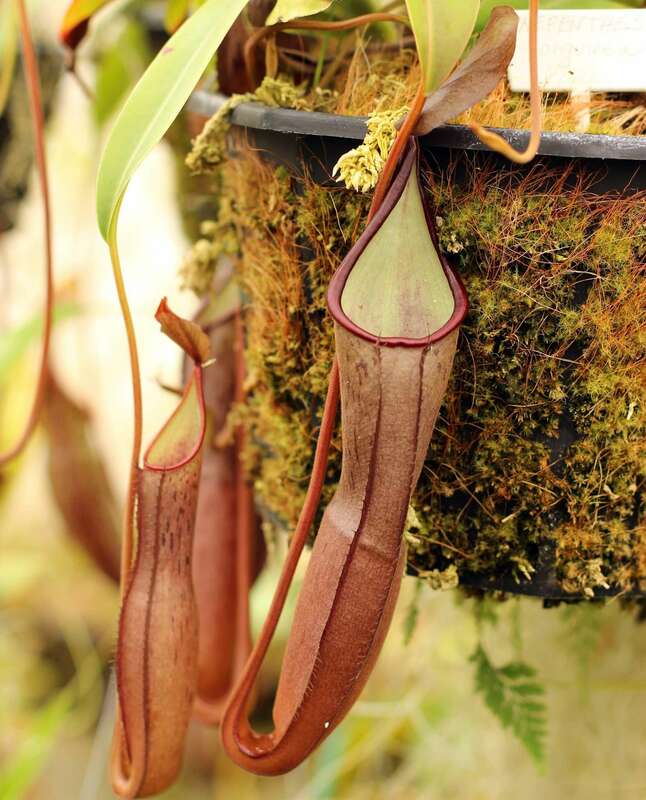 Nepenthes inermis grows on the Barisan Mountains on the western side of Sumatra in the Indonesian provinces of Jambi and West Sumatra. 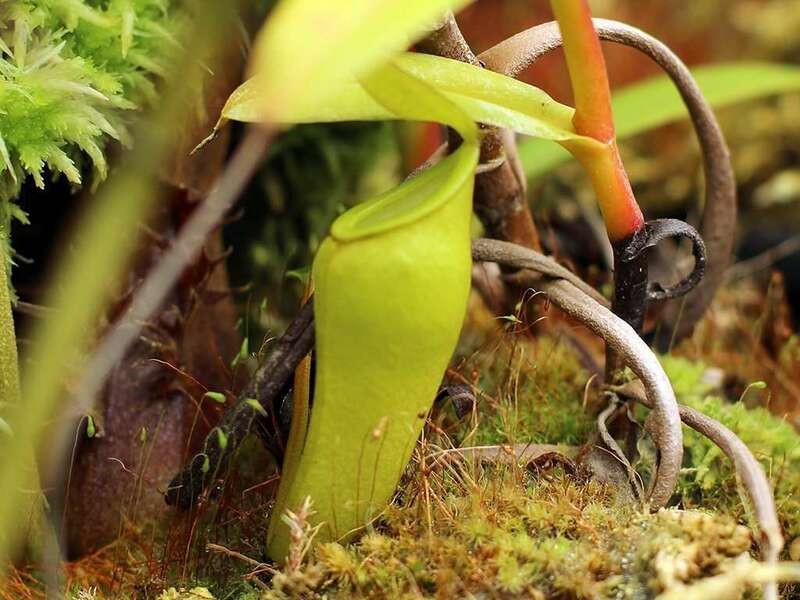 The largest populations are found on Mount Belirang, Mount Gadut, and Mount Talang and even Mount Gadang. 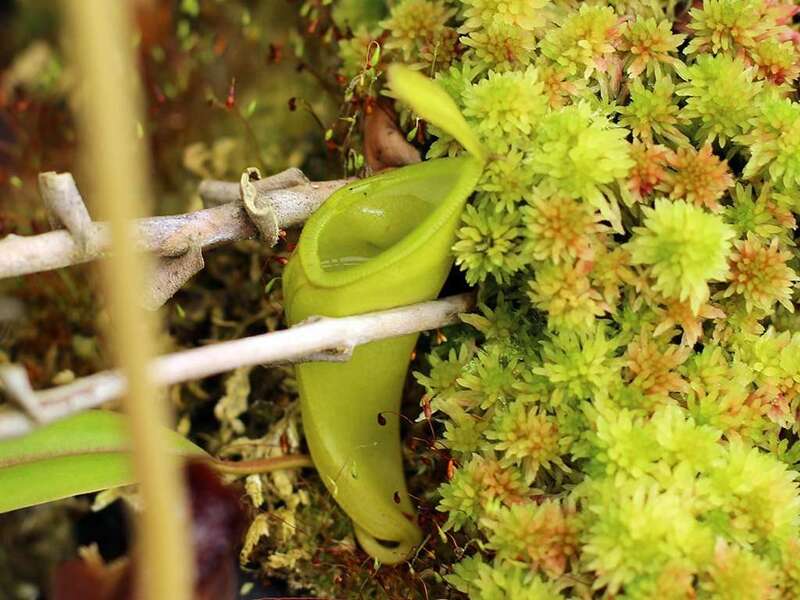 Similar to N. veitchii, it has epiphytic tendencies (growing amongst or on trees) within mossy forests, but gravity wins above 6,600 ft (2,000 m) elevation where N. inermis has more terrestrial habits and grows alongside stunted vegetation. 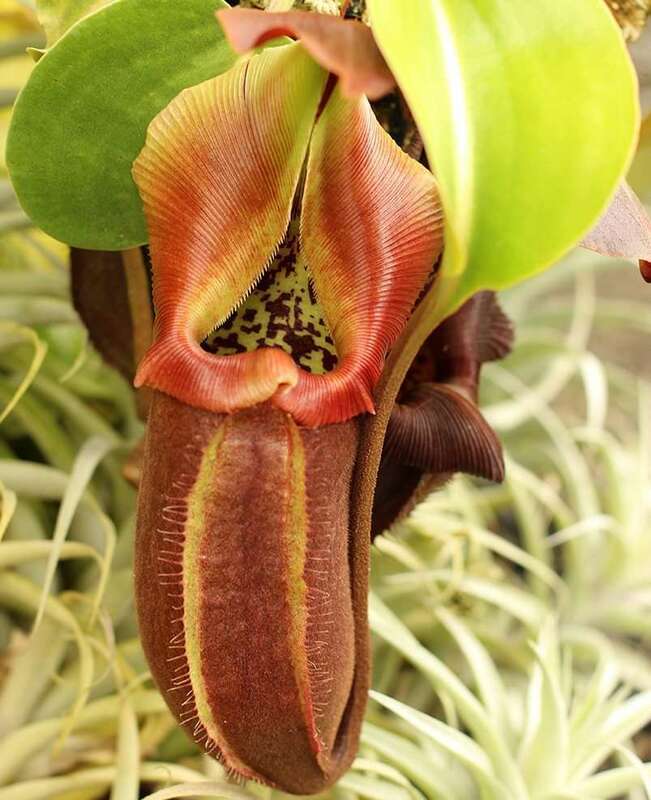 Nepenthes inermis is commonly known for its unique upper pitchers. 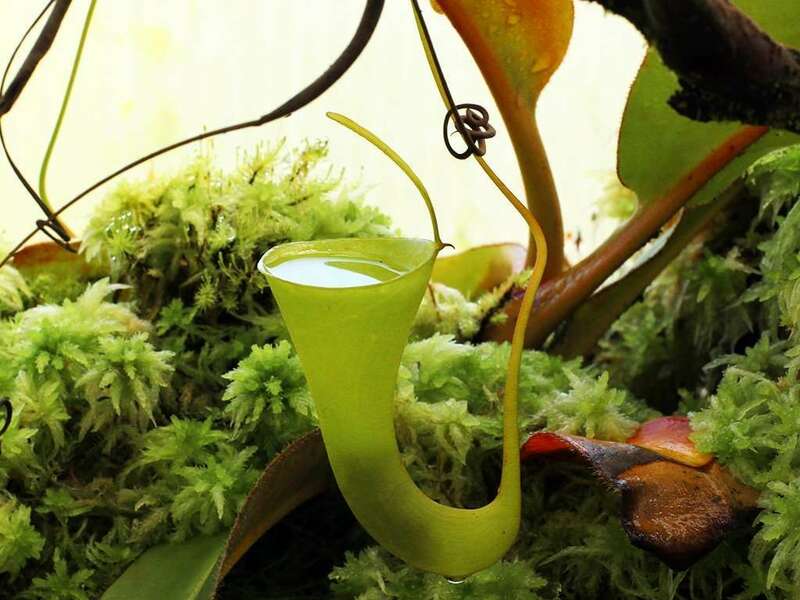 They are small, thin-walled, funnel-shaped, pure green, and significantly lacking in peristome. 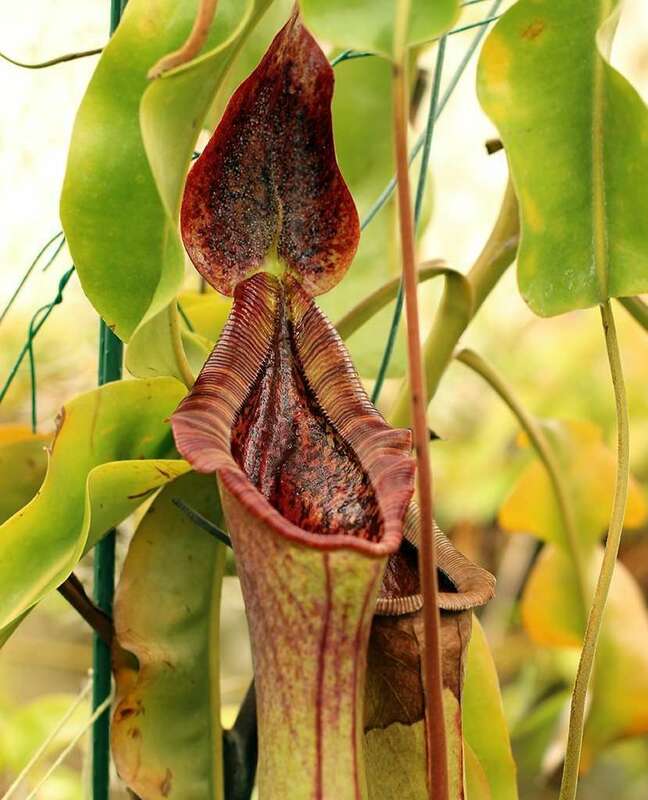 The name inermis comes from Latin, meaning “unarmed” – a play on the fact that upper pitchers are lacking a peristome. 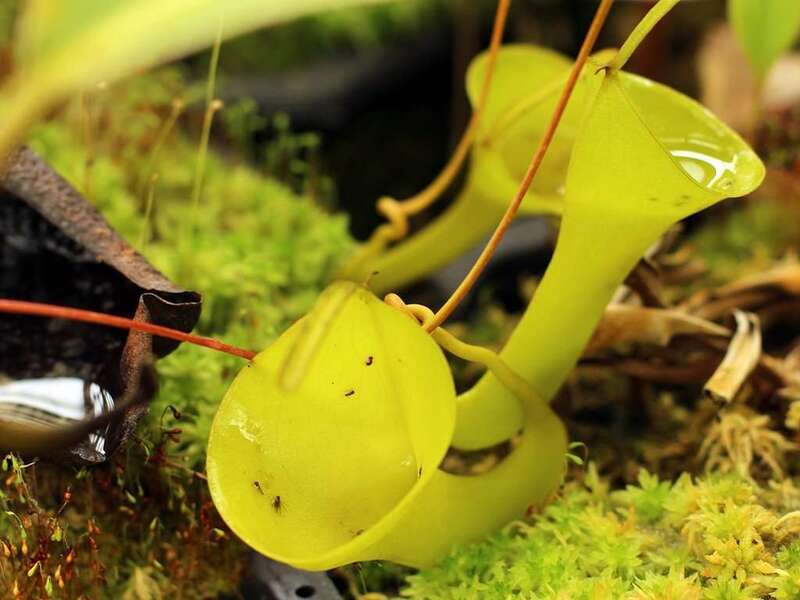 Suspended above the mouth of these 2 to 3.5 inch (5 to 9 cm) pitchers is a thin, filamentous lid. 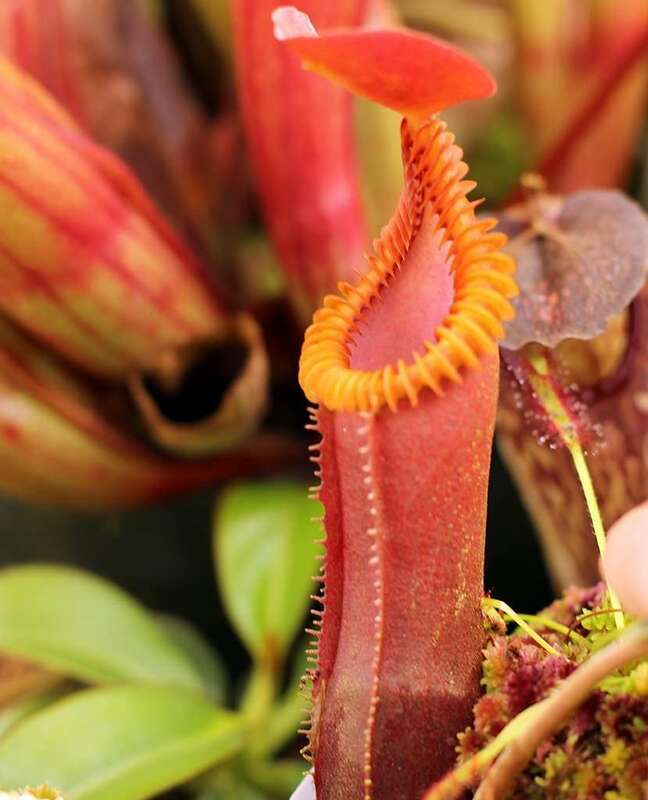 There is conjecture that the nectar secreted by this lid paralyzes feasting insects and causes them to fall into the upper portion of the pitcher. 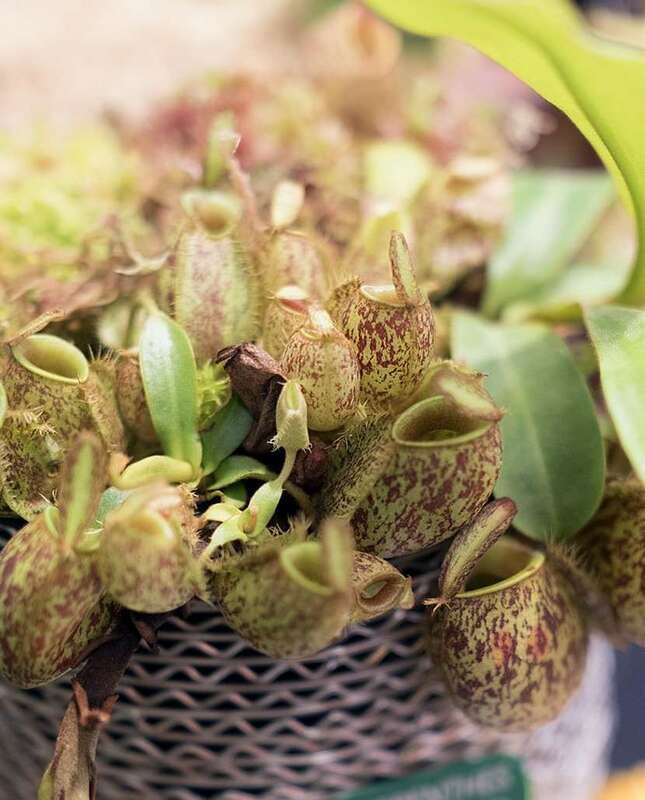 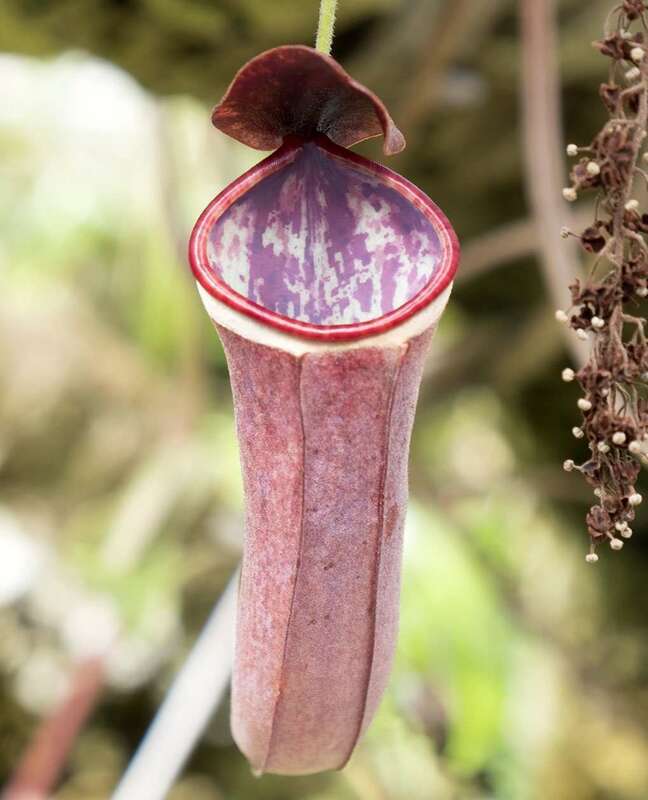 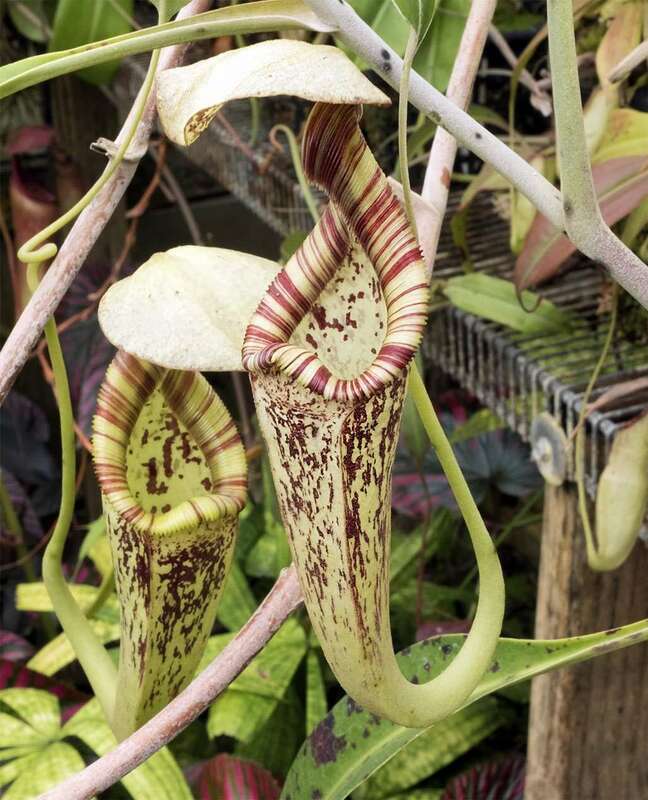 The pitcher produces a thick, sticky, lubricating fluid that insects immediately stick to and then slowly slide down into the digestive juices at the bottom of the trap. 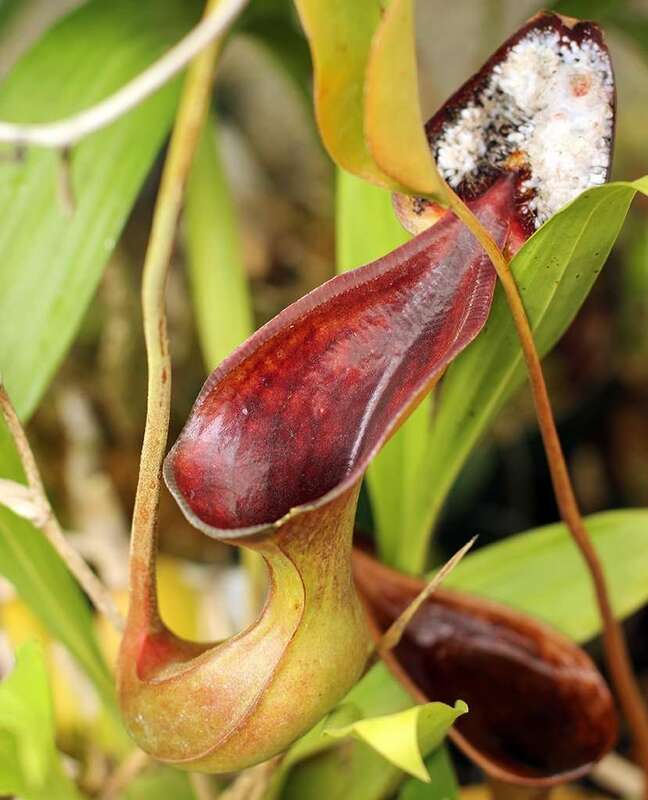 In this way, N. inermis employs both pitfall and flypaper trapping mechanisms. 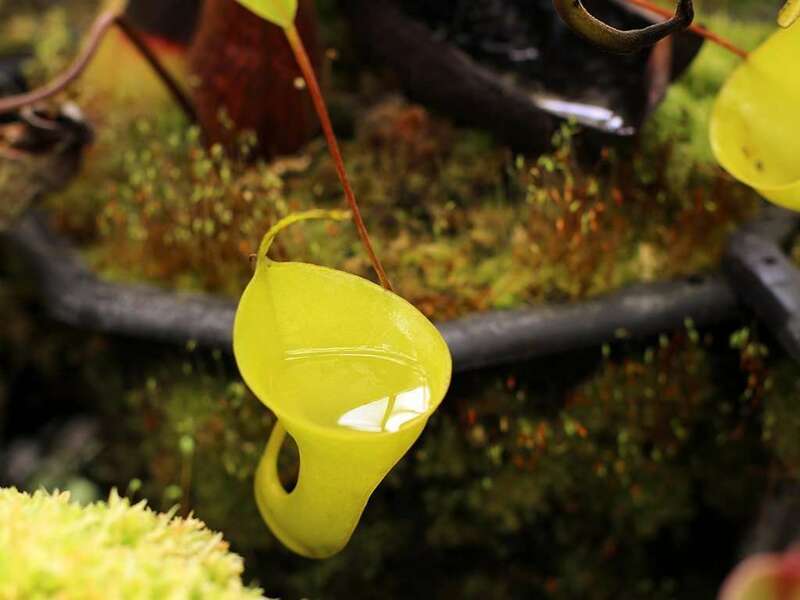 The mucilaginous liquid is secreted from numerous pitcher-wall-lining glands and is so viscous that you can turn a pitcher upside down and pour it out like a stream of honey that will stretch multiple meters before breaking. 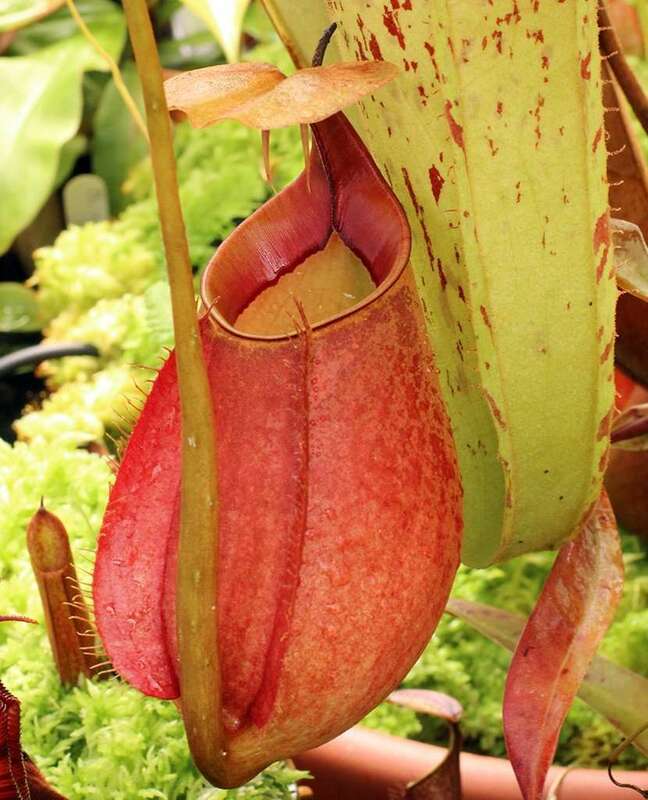 Pitchers don’t appear to have a waxy zone to prevent insect escape, instead relying on this fluid. 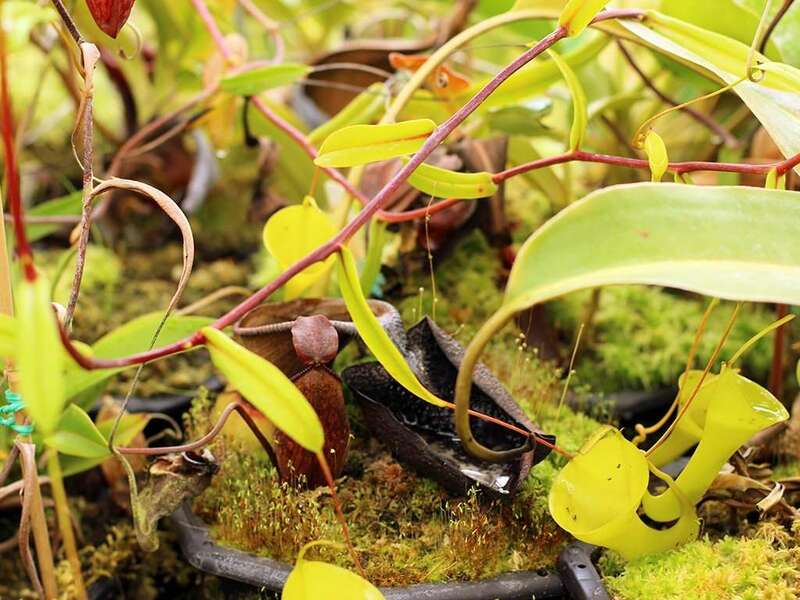 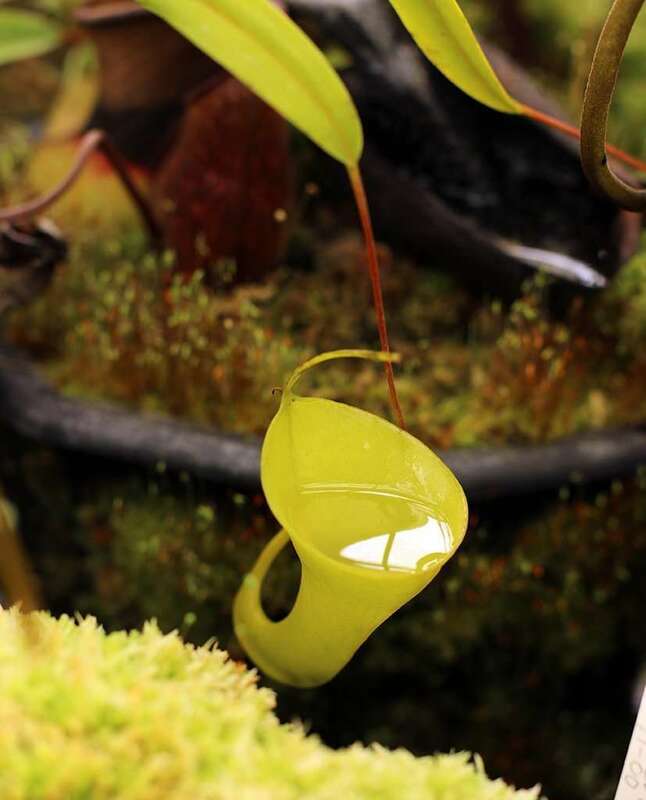 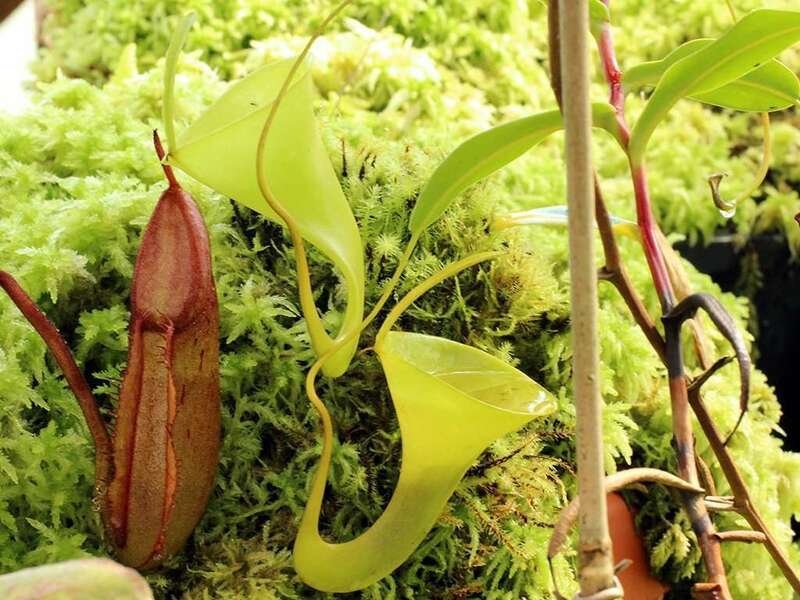 Fun fact: because of how delicate they are and how little protection the lid provides, Nepenthes inermis pitchers frequently collect water and tip over during rainstorms. 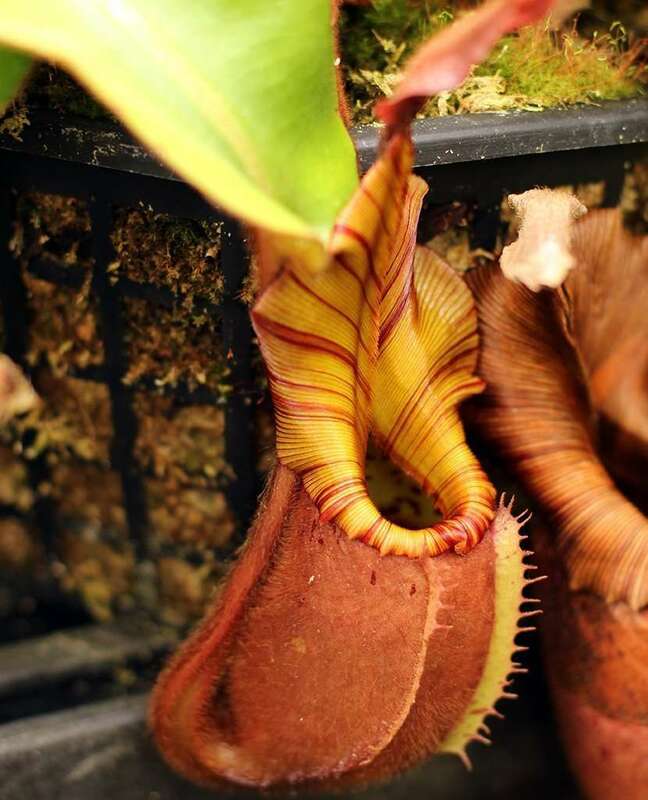 When this happens, the rainwater is dumped out, the viscous mucilage keeps sticking to pitcher walls, and the insects stuck to it remain intact. 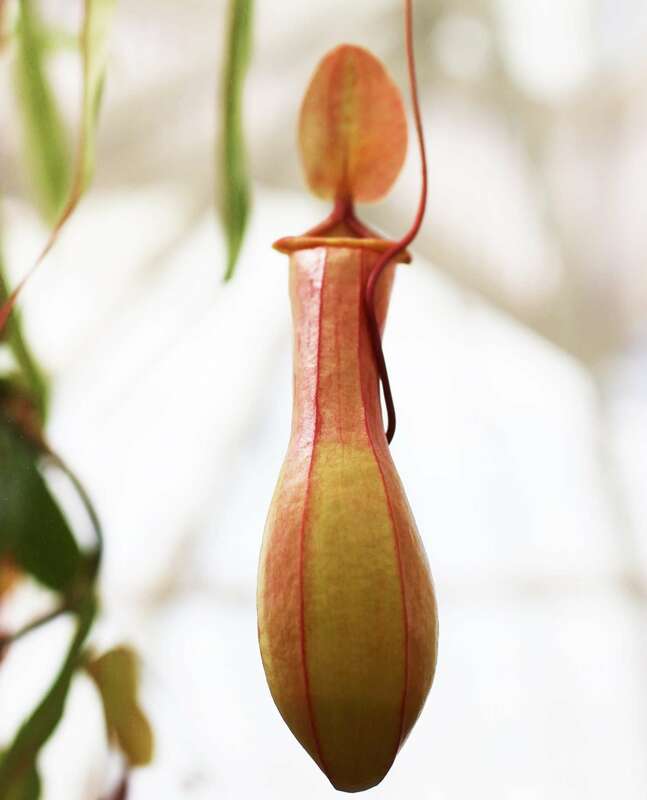 It keeps diner solidly planted against the pitcher wall for digestive purposes as the now-water-free pitchers spring back to their normal upright position. 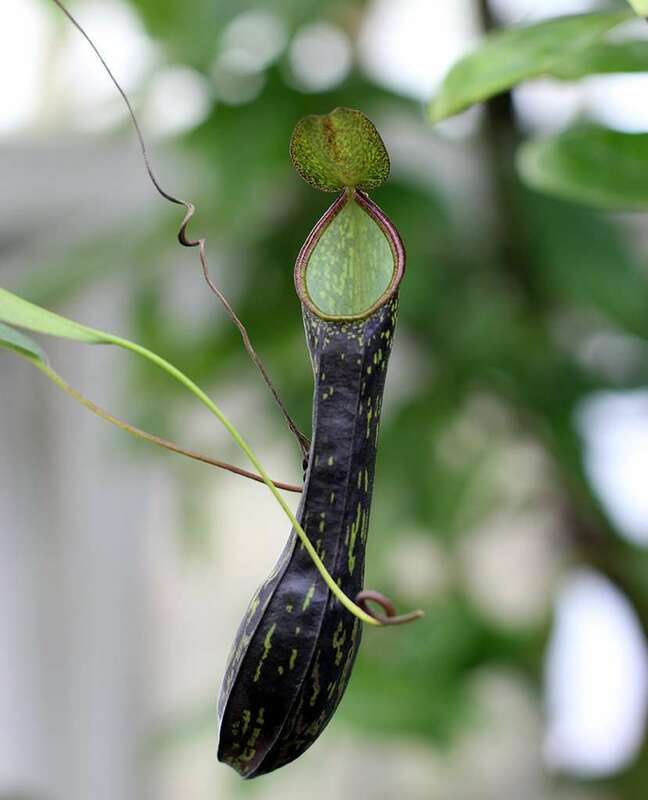 N. inermis is a climber with stems reaching 23 feet (7 m) in length and internodes about 4 inches (10 cm) long. 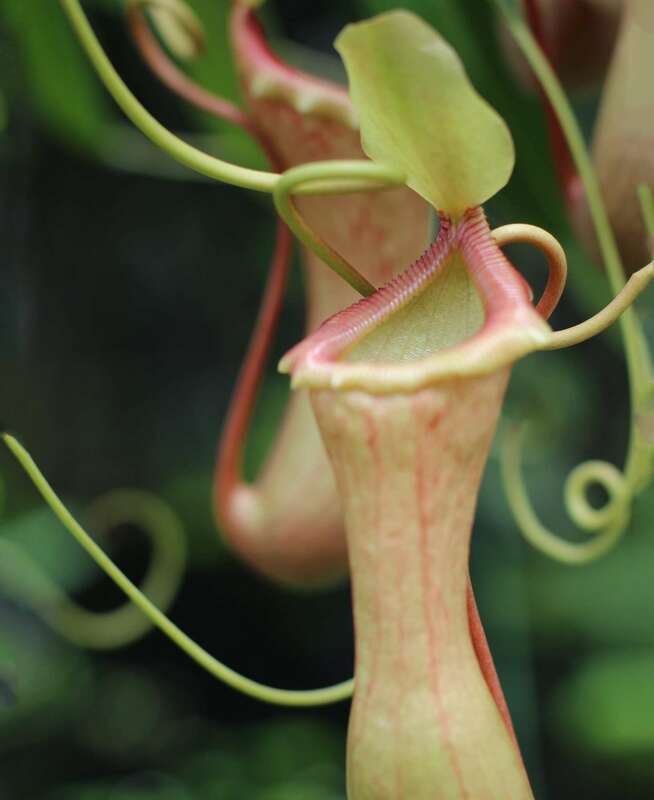 Leaves are short and narrow ending in tendrils about 6 inches (15 cm) in length. 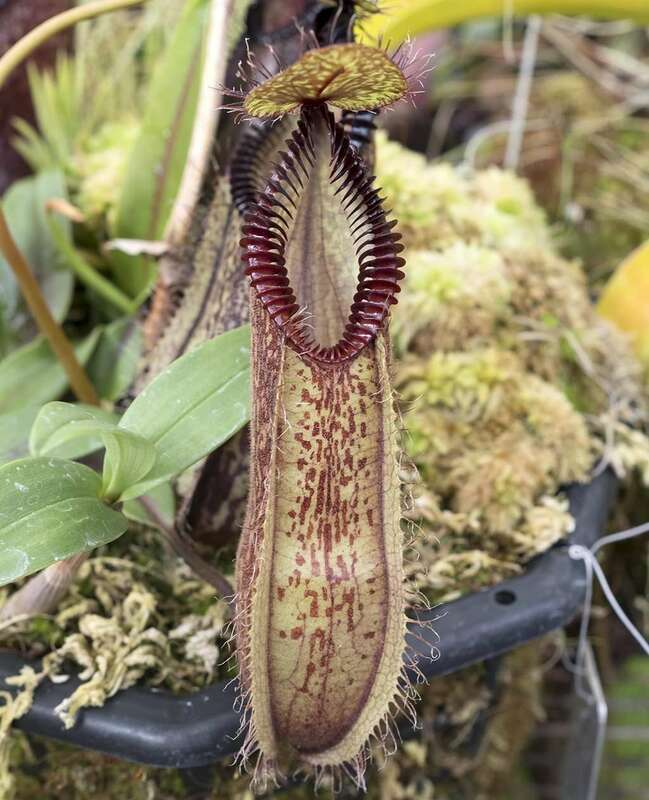 N. inermis rarely produces lower pitchers, but if you click through the images immediately above, you’ll find a couple of photos of these rarities. 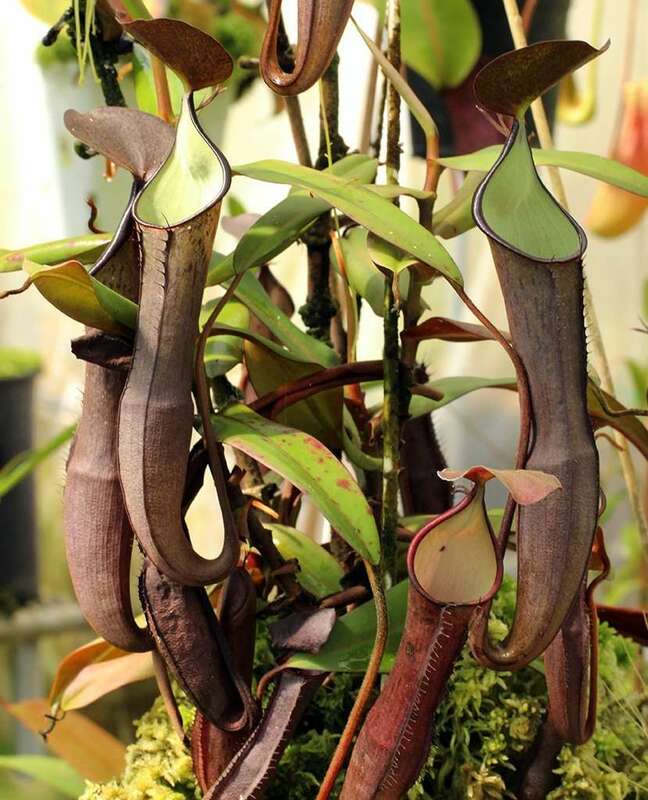 – Just look for the pitchers with a subtle green peristome.